Interested? Check out my talk here! Last week, I got a call around 10pm on a Tuesday night telling me I had been selected to give a presentation at the Toronto Machine Learning Summit (TMLS), AND talk on a panel afterwards. It was pretty exciting, until I realized I had about 36 hours to prep my talk for experts that had been in the industry for longer than I had been alive. Although I had experience with AI and had been researching it for a while, I didn’t have a clue on how to add value to people who already knew everything I was going to say. 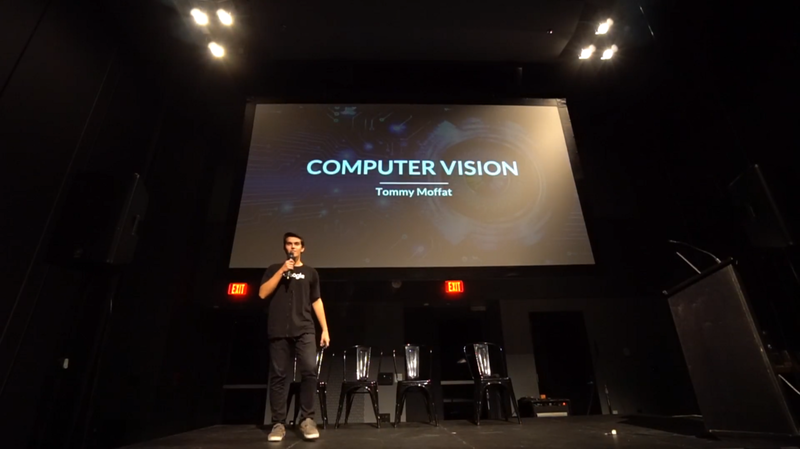 What I didn’t immediately realize was that while I might not derive a new algorithm on stage, I was able to, in a short period of time, discover complex topics like SLAM vision and talk about them in a way that taught the audience something new. In short: If you’re the smartest person in the room, you’re in the wrong room. My first takeaway comes simply from attending the event — most of the conferences I’ve been to have had a broader focus, rather than a specific topic like ML. These conferences are valuable, but they usually fall short purely because they aren’t able to go deep into any one thing. At field-specific conferences like this one, speakers are able to go deep into the really technical aspects of the topic, and in the case of the TMLS, they also put a heavy focus on the business and economic implications of it. While a lot of the technical talks on advanced neural nets and such sailed cleanly over my head, my biggest takeaway from attending an event like this was the networking value. Smart and technical events attract smart and technical people. I met a ton of new mentors and made some really valuable connections within companies like Vevo, RBC, and even ElementAI, a global leader in the AI space. Like I said about events, it’s important for self-improvement that you go deep into something you’re passionate about, rather than stay high-level and explore a wider spectrum. That’s not to say diversity isn’t important; but whether you’re organizing an event or trying to make yourself better, the key thing is to focus in on one theme or topic and completely dominate it. The takeaway here is that it’s more important to focus on building depth than breadth. This goes back to the idea we talk about at TKS of structuring knowledge graph in the shape of a letter T. At the top, the horizontal part represents a small amount of knowledge over a lot of different topics. The vertical part is thin and represents an intimate understanding of one particular topic that you’re an expert in. This is the model we follow at TKS — once there’s a passion, we put all of our efforts into learning everything we can about it. You’ll see in my talk that I keep a careful balance between technical details and reality. This is because my audience spanned a broad spectrum of technical depth, ranging from undergrad computer science students to founders of billion-dollar data companies. My goal for the talk was to add value to the largest proportion of the audience I could. When I first heard that I would be speaking to PhDs and CEOs, I was worried that I wouldn’t be able to say anything they hadn’t heard before. But what I later realized was that the two demographics were reciprocal of each other, and therefore I could give each of them two opposite takeaways: I built my presentation with the goal of adding technical value to those who didn’t have much background, and going deep into advanced topics like the fundamentals of SLAM vision as well as it’s implications for those who already had technical background.